Click on[Billing]in left hand side menu. Click on[Add]button to add new Invoice. 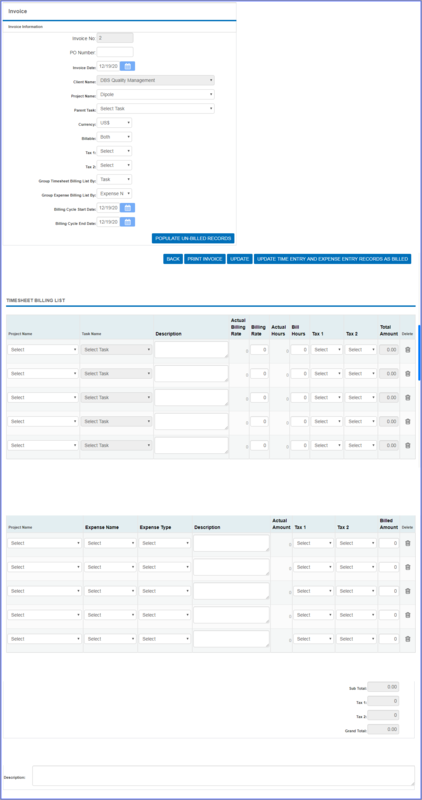 Select the[Client Name]from the list (to whom you want to make the invoice). In order to create invoice for a single project, select[Project]from the list. Keep it as “All” if you want to create invoice for all projects for a client. Enter the date range in[Billing Cycle Start Date]and[Billing Cycle End Date](period to be billed). Click on the[Populate Un-billed Records]to populate all un-billed time and expense entries in invoice for the given date range. Click on[Update]button to update the record. Click on[Update Time Entry and Expense Entry as Billed]once you finished creating your invoice. This will update all time and expense entries as “Billed” in database in order to avoid duplicate invoicing of same data. In[Time Expense Invoice List], click on[Edit]link of record which you want to modify. Update your required modification in[Invoice information]form. Click on[Update]to update this record. In[Time Expense Invoice List], click on[Delete]link of record which you want to delete. Click on[Yes]on delete confirmation dialog. Click on[Print]link to print your invoice. Invoice can be exported to PDF or XLS on print page using export option available. Invoice use company logo which is uploaded in[Admin Options]–>[Preferences]. At the end of finalizing the invoice, you need to mark ”Billed” for the time & expense records included in the current invoice to prevent double invoicing of already billed entries. Click on[Edit]link of record which you want to modify. Click on[Update Time Entry and Expense Entry Records As Billed]to make all time & expense entries ”Billed”. [Billed]status of time entry records and expense entry records can be changed from[Billing]–>[Time Billing Worksheet]and[Billing]–>[Expense Entry Worksheet].